We take pride in keeping our campground neat and orderly. Your cooperation is expected and appreciated. Management reserves the right to evict anyone who refuses to comply with all the rules and regulations as provided. Rules are for your safety and to ensure that you and your fellow campers enjoy your stay. Please read and follow these rules as well as making sure all your guests and visitors abide by them. Motorcycles are not allowed in the campground and must be parked across from the office. Check in time is 1:30PM, check out is at 12:00PM. Swimming in pool after check out is not permitted. If you wish to extend your stay, please register in the office as a day visitor. Campground office opens 8:00AM to 9:00PM July and August. You must arrive by closing time to obtain a campsite. Base rate is for 2 adults and 3 children (17 years old and under). All others must pay per each adult and per each child. Two adults maximum allowed per site. Campground management has final decision if more adults are to be allowed. All camping groups must have one adult 21 years or older . Only one camping unit and one vehicle per site. Camping unit and vehicle must be parked on the campsite. Parking between or behind sites is not permitted. Extra vehicles, car dollies, ect, must be parked in designated areas or as directed. Do not park in the road or on vacant sites. Small tents for young children may be allowed, but must be approved by the office. Vehicle registration tag must be displayed upon entering campground and at all times while on campground. Security gates are in use at all times. Gate cards are issued upon check in and require a $10.00 deposit. Deposit is returned with the return of the gate card. Gate cards are issued to registered campers or their guests only. Lending of gate cards to non-registered persons is grounds for immediate eviction without refund. Absolutely no refunds! A camping credit for current year may be issued by campground management decision. The campground management reserves the right to interpret all rules. The management reserves the right to refuse service to anyone; this is a privately owned campground. Advertising and soliciting in the campground for private gain is prohibited. 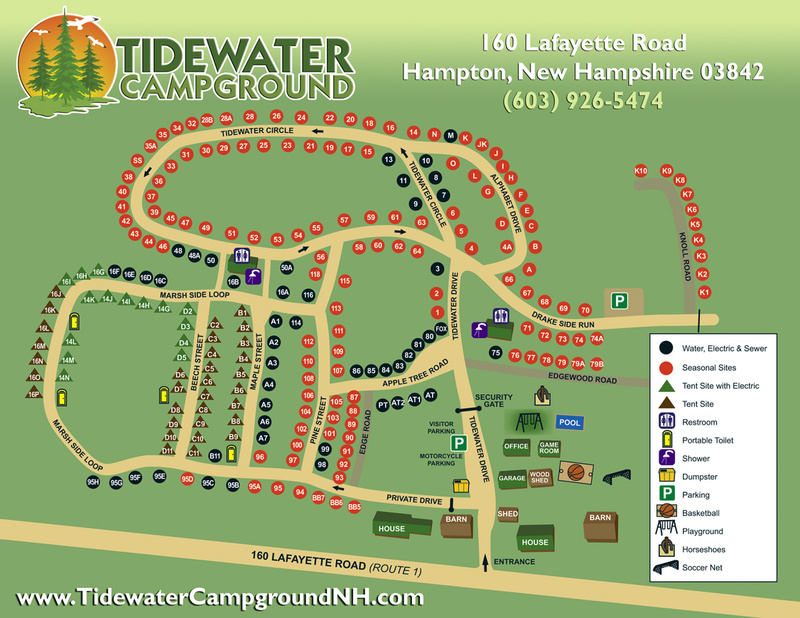 Tidewater Campground Limited Partnership assumes no responsibility for accidents or injury to our campers, their guest(s) and/or visitors or for the loss of money, jewelry, or valuables or loss from any cause. All campers must notify the office in advance of any guest and/or visitors they are expecting. All campers, visitors, and guests must register in person at the office and pay a fee. All visitors are allowed to check in at 9:00AM and must check out no later than 9:00PM. No visitors allowed on holidays or weekends. Guests are allowed to check in at 10:00AM and must check out by 12:00PM on day of departure. All guests and visitors who stay 20 minutes or less will receive a refund. Guests are allowed on holidays and weekends. Campers and their guests and/or visitors who are uncooperative or violate rules may be asked to leave with no warning or refund. Campsites must be kept clean at all times. When leaving, please clean up your area. No trespassing on other campers sites. Do not take any items including firewood from any campsite, occupied or not. Do not cut across sites to access other areas of the campground. Cigarette butts must be disposed of in a neat and safe manner. Do not throw cigarette butts on the ground. Electric heaters are not allowed without permission and paying extra fee. Generators are not allowed unless very quiet and must be off between the hours of 10:00PM and 8:00AM. No washing of camping units and/or vehicles is allowed. No waste water, gray or black is to be dumped on the ground. All non-recyclable garbage should be placed in plastic bags, tied and placed in the large dumpster across from the office. Recycling is required and recycling bins are also located across from the office. Campfires are allowed until 11:00PM. No outside firewood allowed to be brought into the campground. (Please refer to Dont Move Firewood. Campfires are allowed weather permitting. Your campfire must be extinguished before leaving campsite or retiring for the evening. Never leave a campfire unattended. Do not put or burn trash, plastic bottles or cans in the fireplace. No moving fireplaces (it is a state law) and chopping wood is not permitted. No cutting of standing trees (dead or alive). No defacing trees or bushes. Chain saws are strictly prohibited. Messages are not delivered to the campsite; messages will be posted at the office. Emergency messages will be delivered to the campsite at once. The swimming pool is seasonal and will be closed at the managers discretion, and will only be open as weather permits. The swimming pool opens at 10:00AM and closes at 8:00PM or at dusk. No lifeguards are on duty at any time, swim at your own risk. An adult must accompany children under 14 years of age. Absolutely no swimming alone at any time. No diving, no jumping into the pool is allowed. No balls or throwing devices are allowed. Any and all additional rules posted at the pool must be strictly adhered to. Please help keep our showers and restrooms clean. An adult should accompany children 10 years and younger. If any problems arise with restroom, showers, or portable toilets please notify the office at once. No washing of clothes and/or dishes in restrooms or at outside water faucets. Quiet hours are between the hours of 10:00PM and 8:00AM and are strictly enforced. Radio, television, stereo volume, disturbing noises and activities must be controlled during these hours. Children must be kept quiet during these hours. Children must be on their own campsite by 11:00PM or with their parents. Parents or adults in charge must not leave children at the campground without proper supervision at any time. Parents are financially liable for damage caused by their children. Parents are to supervise and assume responsibility for all actions of their children. Firearms, bows and arrows, and fireworks are not permitted in the campground. No climbing trees or playing in and around restrooms. Do not move picnic tables, only one picnic table per site. This is a family campground. Alcoholic beverages, if any are permissible. Adults of legal age must consume alcohol at the campsite. You must be 21 years of age to consume alcohol, New Hampshire Law enforced. Rowdiness, profane language, and intoxicated behavior will not be tolerated at any time. Excessive noise will not be tolerated at any time. Power tools are prohibited unless prior permission is obtained. Radio, television, and stereo volume must be played at reasonable levels at all times. Campers and their children, please no yelling and screaming at your campsite. Security guard is on duty nights at front gate or at the office. If there is a disturbance, excessive noice, any complaint or emergency, please notify guard at once. If guard is not present at gate or office he may be on rounds.